With the new Opal transport card is being phased in for use in pubic transport around Sydney and other bits of NSW, there are changes coming in the way things work. Here are some things I found on the Transport NSW site, and have questions about. 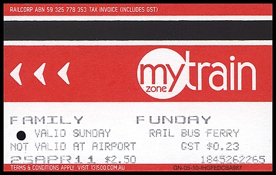 According the Changes to Pensioner Excursion Tickets on State Transit buses (24 April 2014) article, buses are going to stop setting “Pensioner Excursion Tickets, Family Funday Sunday tickets and MyMulti Day Passes“. In the Eastern Suburbs, this is effective from 28 April, and from 1 June for other metropolitan buses. For State Transit buses across Sydney to be ready for Opal, they need to have new technology. Once this happens, some tickets – like Pensioner Excursion Tickets, Family Funday Sunday tickets and MyMulti Day Passes – can no longer be sold on board. The article goes on to say that you can still buy them, at train stations and ticket sellers. So they are not going away immediately, and I’ll assume there will still be technology on the bus to use them. So, why does installing new technology stop you selling the tickets? Currently when bought on a bus, the driver just drops the ticket into the existing green Travel Ten machines. So I don’t see the problem. Customers who qualify for $2.50 Pensioner Excursion Tickets will be eligible for the new Gold Opal Senior/Pensioner card and no travel conditions will change. Weekly Travel Reward: after 8 paid journeys in a week all further journeys are free. While I understand that standard Opal cards give you free travel after 8 paid journeys, how does this apply for Pensioners? Pensioners have a maximum cost of $2.50 a day, which are probably going to consist of multiple journeys. Does this mean that, if you do 4 journeys on Monday and 4 on Tuesday, you won’t be charged for trips on Wednesday? Or, is each day considered one journey, so you get the 8th day or a 7 day week free? Not that is is really a big thing, $2.50 a day for pensioners is a reasonable deal. I’m just interested in the way they decided to word it. There may be a bullet point they forgot to remove. More worrying though, is the question, how will they deal with Family Funday Sunday tickets? But, how will this work under the new Opal card? If each family member has an Opal card, how will the bus/train know they are members of the same family? And that each member should only be charged a total of $2.50 for the whole day? Will families need to register all they cards together online to count as a family? What constitutes a family? Looking at the Terms & Conditions, it says “The travelling group must be related by family and include at least one adult and one child“. So the group could also consist of uncles/aunts/grandparents/etc. If the previous question is true, do they all need to register together? Will it be handled in some other way? I’d be interested to see Transport NSW’s scenarios and use-cases for these family tickets, to see how they think this will work. Or, has Transport NSW put the Family Funday Sunday tickets in the too hard basket, and decided to scrap them altogether? This entry was posted in Social, Tech, Travel and tagged bus, Opal, public transport, tickets. Bookmark the permalink. It doesn’t. But it’s a handy excuse, since I’m fairly sure the end goal is no ticket sales on buses at all. Does this mean that, if you do 4 journeys on Monday and 4 on Tuesday, you won’t be charged for trips on Wednesday? Or, is each day considered one journey, so you get the 8th day or a 7 day week free? Opal cards have two different but similar concepts: Trips and journeys. The Opal website constantly confuses its usage of the two, unfortunately. One journey can consist of multiple trips with a gap of less than an hour between each bus/train change. So if there’s more than an hour between each trip, then yes, that is 4 journeys a day, and Wednesday onward is free. I’ll be curious to know how the family tickets work, if you find out. Yes, what I expect the reasoning is too. One journey can consist of multiple trips with a gap of less than an hour between each bus/train change. It would be interesting to know, if you travelled around all day, with less than an hour between trips, would it all be considered 1 journey? hi how stupid is it for the poor pensioner to have to use credit card to purchase the opal card I deal with a bank book why should I carry all these cards for.